Gen. Scott Miller spoke to ABC News' David Muir in Afghanistan. Gen. Scott Miller, the top U.S. commander in Afghanistan, has taken over at a pivotal moment in America's longest war. The four-star general was here right after Sept. 11, 2001. "Did you ever think that right after 9/11 when you were here that you’d be here all these years later as commander?" asked ABC News and "World News Tonight" anchor David Muir, as the two traveled by helicopter from Kabul to Camp Commando, a few miles south of Afghanistan’s capital. "Absolutely not. I didn’t think it’d be 17, 18 years later," Miller said. Miller took Muir and the ABC News team to the camp to see what the military deems could be a crucial part of any possible endgame in the war in Afghanistan. At the camp, U.S. Special Forces are training Afghan forces as the Americans keep watch. The Afghans -- with support from the coalition and under Miller -- have accelerated the fight against the Taliban. Negotiations between the U.S. and the Taliban are ongoing in an attempt to end the war, even as special forces continue to move against the group with deadly force. In January, U.S. Special Representative for Afghanistan Reconciliation, Ambassador Zalmay Khalilzad, defended talks with the militant group. "The political talks, I do think are, are positive. I've talked about this fight multiple times -- and it is a fight. 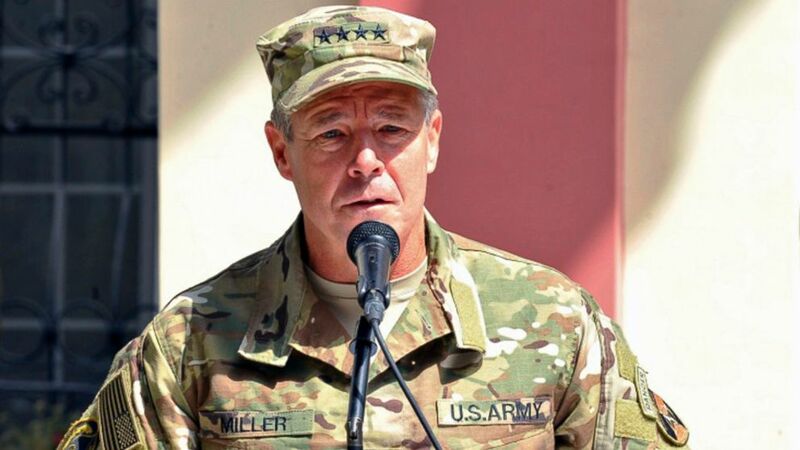 Neither side will win it militarily, and if neither side will win it militarily you have to move into a -- towards a political settlement here," Miller told Muir. (U.S. Air Force/Tech. Sgt. Sharida Jackson, via AP) Sept.2, 2018 file photo, provided by the U.S. Air Force, shows U.S. Army Gen. Scott Miller, commander of U.S. and NATO troops in Afghanistan, delivering remarks during the Resolute Support mission change of command ceremony in Kabul, Afghanistan. Afghan officials said, Oct. 18, 2018 that three top Kandahar province officials were killed by their own guards in an attack at a security meeting that also wounded two U.S. troops. NATO officials say Miller escaped unharmed. "But do you think those political talks with the Taliban are key part of any endgame here?" Muir asked. Just weeks ago, Afghan special forces, backed by the Americans, stormed a Taliban prison to rescue their own troops being held captive inside, according to a military public information officer. Muir’s visit to troops in Afghanistan comes amid reports that President Donald Trump wants to reduce the American presence in Afghanistan, eventually putting an end to America’s longest war. There are currently about 14,000 U.S. troops serving in a counterterrorism mission against the Taliban and ISIS, and as part of a train, advise and assist mission for Afghan security forces. "There have been reports the president would like to see a drawdown of U.S. troops here (in) Afghanistan. Has there been any order to do that?" Muir asked. "No. ... First of all, I have the authorities of the capabilities that I need from the U.S. and the coalition standpoint to work with our Afghan partners. At the same time, as a commander, I'm always trying to bring the footprint down, bring our force structure down," Miller said. The U.S. commander made it clear that he is a general, not a policymaker, and that he would follow his chain of command as well as President Trump. U.S. military officials told ABC News that part of any endgame for them was making sure that Afghan forces were prepared to fight the insurgency, which also now includes ISIS in Afghanistan. Afghan forces are fighting ISIS with support from U.S. airstrikes, but unlike the Taliban, ISIS has no desire to negotiate, officials said. Miller made clear that there was no endgame in Afghanistan that provided a safe haven for terrorists. "In 2001, it was very clear to the world what we were doing in Afghanistan. In 2019, there still are national interests that need to be safeguarded," he said.